Nelly’s Case: A Tug Wyler Mystery Series. 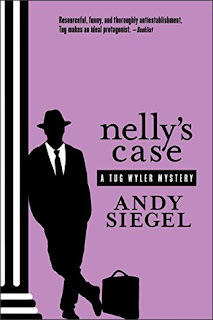 Andy Siegel. CreateSpace Publishing. Copyright 2018. pb. 324 pp. ; ISBN: 9781981553341. Nelly Rivera had a horrible fear of dental treatment and so she agreed to be slightly knocked out with anesthesia for treatment of a simple cavity. Her sister, Jessie, was there, attempting to calm Nelly’s anxiety. All seemed well but quickly went disastrous. Nelly was in a coma, and doctors seemed unable to issue a positive prognosis. The remaining question is why did Dr. Grad leave the dental room immediately after he started the IV of anesthesia? Tug Wyler appears and endeavors to have Jessie start a malpractice case against Dr. Grad. Jessie must be in shock as she’s almost unable to communicate her wishes to Tug or anyone at the hospital. In between this case, the reader gets a fill-in of Tug’s background as personal injury attorney who receives case from Henry, a snappy, tough lawyer who knows how to wheel and deal his way through any court system, defendant or plaintiff. There are some very funny moments in the interactions between these two attorneys which lightens the intensity just where it’s needed. No spoilers here but enough to alert the reader that this case involves far more than a dental procedure gone awry. Red alert: life insurance policy! Jessie remains unavailable and only occasionally visiting her sister who is in a rehabilitation facility slowly responding to medical attempts to bring her totally out of the coma. Tug may be under Henry’s thumb, but Tug’s not only alert to making money but engaging in any case where injustice and fraud are suspected. Both Henry and Tug wonder why the defendant attorney knows more facts about this case than they do. Also, where are the other members of Nelly’s family in the face of this upsetting development? There are more guilty parties in this matter than one initially suspects but the author knows how to time out the suspenseful scenes that lead to the final discovery and delivery of justice. Tug Wyler is definitely a true personal injury attorney who educates the reader about the lawsuit process, the documents and discovery aspects to be clarified and obtained and the collection of relevant and irrelevant evidence. This is a fine mystery that all mystery fans will enjoy. Nicely crafted, Andy Siegel.